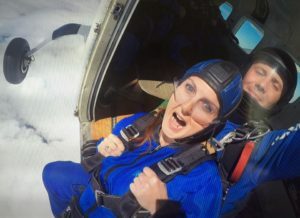 Claire Poole recently tied herself to a large man (the easy bit) and threw herself out of an airplane (the hard bit) to raise much-needed funds. “My fundraising for PRDA took place on Saturday 18th June at Goskydive in Salisbury. After a mostly sleepless night, due to possible cancellation because of the weather and poor health, it was an early start. So, I was preparing to do a skydive from 15,000ft with a free fall of a whole minute, plummeting to the ground at 125mph! After arriving at Goskydive at 9am, I was trained, suited, harnessed and fully prepared to climb aboard the plane by 11am. With no nerves in sight, but ears popping all the while, it was soon my turn to be thrown into the clouds. And what an amazing, awesome experience. The weather wasn’t great, it was cold, cloudy and a little damp up there. However, that didn’t matter at all. I would have jumped in any weather to raise money for this fantastic charity I have the honour to be part of. Well, the parachute opened (phew!) and after tumbling to the ground at such high speed and not being able to hear a single thing, the stillness and quiet of drifting and flying like a bird was fantastic. Shane Hardwick my instructor was just amazing, from our first handshake to our final hug, when he got me safely on the ground.